Extension Faculty Building Engineering, TU/e. The extension for the faculty had to become a social meeting point for the exchange of ideas. The existing faculty building contains from the ground level up, a workshop (0), design studio’s (1,2,3,4) and offices (5,6,7,8,9). A library, lunchroom, bookshop, expo plaza, auditorium andoffice space for student service centre had to be added. By integrating the demanded functions in a continuous flowing traffic space connecting the design studio’s, coincidental meeting and exchange of ideas are stimulated. 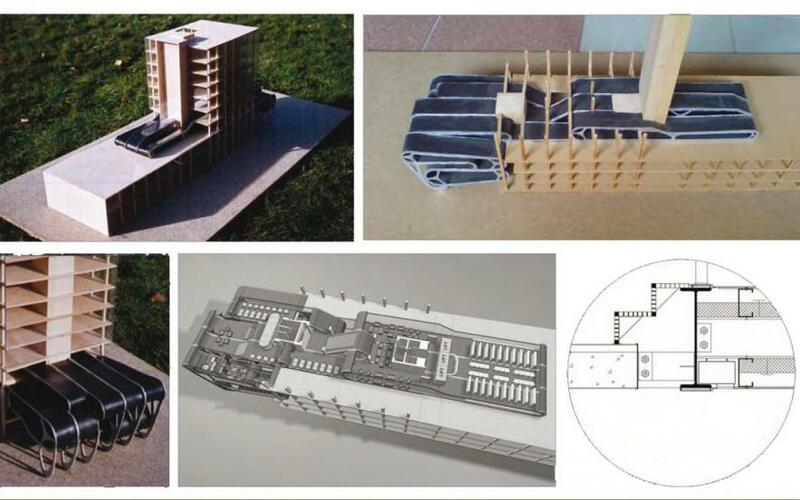 By differentiating the traffic space in both material and detail from the existing building it becomes an autonomous object with a strong progressive identity serving as a beating heart for the faculty. The folded construction is designed to decrease span and reduce bending forces. The cladding is done in rubber.